We don’t recognize our entitlements for the soul-assassins that they are because we have bought into their lie. These murderers, after all, come from our own hearts. We are killing ourselves. We are ruining our own lives. And, being blind to the truth, we go on committing spiritual suicide with every unwise purchase, every indulgent bite, every self-centered tantrum. Our soul gasps for breath, but we press the pillow of our selfishness down upon its mouth until the unbearable spiritual twitching stops and the corpse of our soul lies still and cold. You are dying one moment of entitlement at a time. The person you are becoming is largely determined by how often you say “Yes” or “No” to your sense of entitlement. Who you will be ten years from now is the culmination of the one million small decisions you make from now until then. You might even think about this way: The person you are becoming is largely determined by how often you say “Yes” or “No” to your sense of entitlement. Granted, it’s not the only factor in the equation, but it’s a very big part of it. 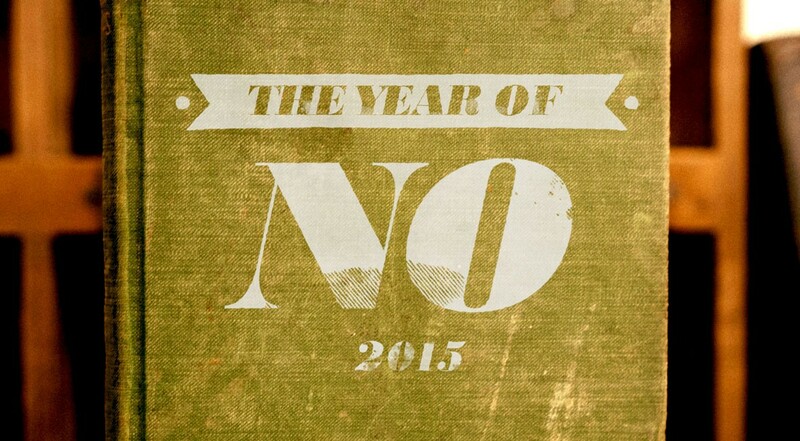 This is why I think The Year of No is so important. If entitlement is a virus of the soul, then self-discipline is your immune system, and self-denial is your white blood cell army. Saying “No” to your entitlements clears your head of the lie they have been telling you. Saying “No” gives you soul-strength to fight back. Saying “No” to your entitlements opens your eyes to see the grace and provision of God in your life. It’s time to kill the silent killer. The choice is simple: It’s either your soul or your entitlement. Which will you choose? Such needed wisdom! American materialism fuels our economy and has become our soul-ducking culture. Thanks for helping me to recognize that I have waddled around in prideful entitlement far too long. This is the year God will help me to change as He works through you to open my eyes to the layers of “No’s!” that must become habit if my husband and I are going to live in financial peace. Lynne, I’m so glad this has blessed you. May God give you grace and strength to say “No” to those entitlements!